What is wrong with the steering on some of the 2016 Chevy Silverado 2500HDs? A number of owners of the 2016 Chevrolet Silverado 2500 HD complain that the steering is loose or wanders. Chevrolet has issued a Technical Service Bulletin about it, but owners say it doesn't fix the problem. 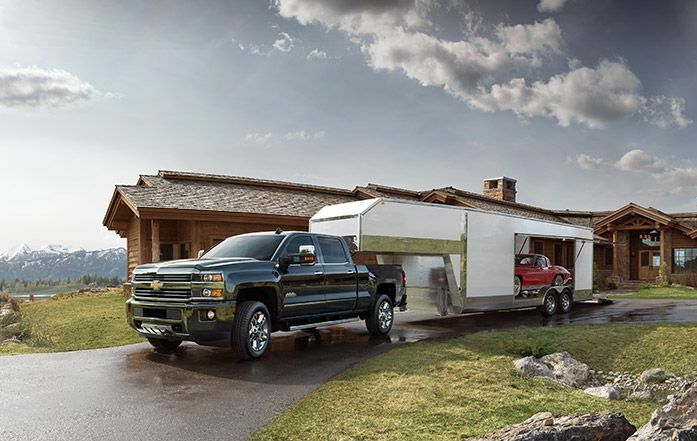 One of the hottest topics on a Chevrolet Silverado forum right, now concerns problems with steering on some of the 2016 Chevrolet Silverado 2500 HDs. Some drivers are complaining that the truck steering is so sloppy, they are afraid to drive it. Since that first post, there have been nearly 400 others. Most are other 2016 Chevy Silverado 2500 HD owners who are reporting similar issues. General Motors has issued a Technical Service Bulletin for the problem, it is lengthy. “#PIT5501C: Steering Feels Loose / Excessive Lash / Fluid Leak At Lash Adjuster (Adjust Steering Gear). The following diagnosis might be helpful if the vehicle exhibits the symptom(s) described in this PI. The TSB wants the service people to ask the owners all sorts of questions about where and how the vehicle was driven. Was it driven offroad? Have they towed anything? Has the truck been lifted or modified in any way? Did the problem occur quickly or slowly get worse? Enthusiasts note that the issue seems to be only on trucks built at in Flint, not in Fort Wayne. No indication as to why. In all, there are 27 pages of complaints about this issue. One person who describes himself as a GM tech tried to help the angry owners but was hounded off the site by hostile posters. They are furious that the service departments don’t seem to know how to fix the problem long term and they don’t feel they are receiving help from GM and Chevrolet. As of right now, it appears that the 2017 Chevy Silverado 2500 HDs are not having similar problems. No word of a recall for the 2016s, although the problems are reportedly widespread. I to have a 2016 hd my steering box went 3 times under warranty. GM is trying to offer me a extended warranty and Vermont would not allow them to. I then hear they are giving me another kind of warranty I have yet to receive and they actually went as far as closing my case customer satisfaction complete. I then called again open another case and have yet to hear from GM as they stated they would call o center again in another claim. I have had tremendous support from mcmahons chevy, though I'm at a point they are not responding doing to there service tech now. I did this trying to be respectful to the people I have been talking with and I got no where with GM so i guess i may just lemon this trk which is discouraging to do as i love the trk but there not being accountable for there product. There is no longer a peace of mind driving a 50,000 dollar truck. Seems as a kid growing up I recall something that chevy was the heart of Trucks of America how the world changes. OK GM, you win. Just paid usd$2,800 for new gm steering box flush and alignment at 51,000 miles. GM could not get one of their own boxes for weeks. Did I mention they stalled long enough from when the play began at 30,000 so gm did not engage. This gm box is warranted for 24 months, we will see. My theory is where is Ralph Nader? Another Corvair cover up. How can gm screw up SO Badly. Guess during cost cutting measures the metals purchased came from China, but wrongly spec(ed) and bad QC. Really sad, such a bad deal. Hey! Was it fixed onceyou replaced the steering gear box? Thank you! Just got mine replaced! Such a whip and sooo frustrating! Fed up with GM! I am having a similar issue on a K3500 with 11,000 miles. Any word on warranty coverage or recall yet? I am having the same issue with my 2016 2500 LTZ. As I speak they are replacing the steering box. Only have 21000 miles. 2016 2500 High Country I have had this problem since my truck was new. I brought it in at 2500 miles to have my local dealer fix it. They told me nothing was wrong with it. Now at 25000 miles the problem has gotten so bad they will have to fix it. I hope. I have an apointment tomorrow to have it fixed. I will repost the result tomorrow night. I am also having this same exact problem. I have 3,900 miles on my 2016 chevy Silverado 2500hd LT. There is no way that this amount of play in the steering is safe. How does chevy escalate this steering problem to a full on recall? They had to replace the steering box in my 2016 2500 HD LTZ. I had 10,000 miles on it. Martin, what your problem solved? Cause I'm not satisfied with my dealer conclusion after many attempt to solve the problem "nothing to do, the loose i'm getting is supposed to be standard..." What!? Went the garage three times for this problem. At first, since second winter my truck has been pulling on the left while braking hard from 40 miles/h. If I keep my steering wheel centered, pulling is enough to change lane. Dealer said it must be my winter tires with studs that cause this.... Then few months later, I start to have two, inches slack in the steering wheel. On highway I have to constantly do corrections from left to right to keep rolling in my lanes. Then the dealer applied the refered correction bulletin. Problem was solve at 80%. I still get an 1/2 inche to 1 inche loose that I'm not happy with. Brought it to the dealer today and they say it is normal... I will have to bring my truck to another dealer now, one that can solve this. I'll be hauling my fifthwheel in two weeks and want it to be going straight. It is a security issue. 2016 3500 Duramax with only 22000mi. this weekend retuning from family visit, I was driving in pretty crappy conditions and thought the play I just started to feel was the road. Yesterday driving home from work I said this is not right 2 -3 inches of play in the wheel is not right. I pull a 14K 5'er and that is not going to work! I did notice some patch on the driveway, but in the snow and rain it was hard to tell for sure, the patch was oily but no color or smell. I have an appointment at my dealer 1/19. I will be bringing in a copy of this report and let you know the outcome. 2016 Chevy Silverado 3500 duromax ltz 85000km Dame sloppy steering after I took to dealer for oil change. Perhaps a class action might get them to do a recall!! I have had my 3500 hd already fixed once and now less than a thousand miles of driving it started having play in the steering wheel I had 22,000 on the truck the first time and I have 22,600 now and have to have it fixed again. I wish they would just go ahead and put a new steering in . Because Chevy should be fixing this problem it's very unsafe I guess everyone that has this problem is going to have to ban together and start a class action lawsuits. 2016 Silverado 2500HD Duramax 13k miles. Steering is loose and it seems to get worse as speed increases. I made an appointment with the dealer for the end of next week. We shall see. Was in Florida heading home to Illinois when I noticed I had a little play in steering wheel. By the time I left Florida 3 hrs later it had a lot at least 3” swing. Called dealer and documented what was my truck was doing and they said I will need to make app. to check it out. Hope we make it home. Yep im in same boat my 2016 chevy silverado 2500 hd just starting leaking power steering fluid out of the blue. I don't have an issue with with steering just leaking has 18000 miles on it. I have a 2016 Silverado 3500 LTZ that drives very nice until you put a trailer behind it. Then you don't want to let go of the steering wheel - constantly correcting it. Not much fun to drive and downright dangerous on rough/snowy roads.